1/ Extreme self centeredness/self obsession, that shows up as the relentless pursuit of personal gratification and attention seeking, social dominance and cold blooded ambition. 2/ The inability to take responsibility for one’s behavior or keep commitments, while being dependent on others to meet his/her responsibilities – in essence, being functionally impaired. 3/ Lack of empathy, as well as the need to be right, perfect and admired at all times. 4/ Feeling entitled to special treatment, regardless of circumstances or accomplishments. At its core, narcissism is a defense against deep seated low self worth that is pushed out of the conscious mind of the narcissist. This rigid kind of personality structure tends to develop in response to childhood neglect, abuse or trauma, where emotional needs are unmet or denied. If the narcissist’s wants and needs – real or imagined – are not met in adulthood, s/he is prone to fly into rages and ‘defend’ her/his low self esteem through blaming or attacking others. S/he is usually not consciously aware of this process, as the defense of blaming others is much more developed than any insight regarding the appropriateness of their behavior, or the potential for taking responsibility for themselves. Most narcissists have an underlying belief that they are helpless to make themselves better, and are stuck in a perpetual victim stance where they see themselves as innocent bystanders in a world that continues to do them wrong. If you grew up in a narcissistic family system, you probably felt unsupported, neglected or abandoned. You were likely told – directly or indirectly – that you had to put your narcissistic family member’s needs first, or got accused of being ‘selfish’, and punished if you didn’t. Your narcissistic parent may have had a substance abuse problem. If you did not go along with the narcissist’s agenda you were likely criticized, blamed or shamed. In other words, you were scapegoated. You are not allowed to be yourself – to have your own needs, personality and independence. You are scapegoated and labeled as self-centered and possibly “narcissistic” for having your own wishes and interests, and face punishment if you pursue them. You experience a lack of real empathy, though it may be feigned. Even if you are empathic towards family, you are accused of being uncaring for not putting others – especially the narcissist – first. Family members may align with the narcissist, who is viewed as either the legitimate power broker or a tyrant to be appeased. 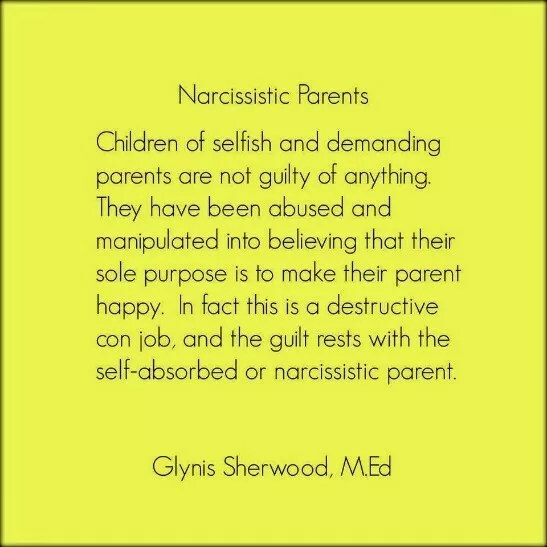 These narcissist supporters can be the other parent, siblings, their children or even extended family. Lies are perpetrated to encourage family to side against you as the family scapegoat. You are expected to act like a parent to your parent(s), rather than having your parent(s) care for you. You lose love, approval, privileges, etc. if you can’t or don’t. Poor and inappropriate family boundaries are the norm – e.g. intrusiveness, mistreatment, abuse is normalized or sanctioned, disrespect, negligence of health and/or safety, externalization of the problem onto those who point it out. Ongoing scapegoating, criticism, attacks, blaming, shaming or shunning are used as a threat or weapon by the narcissist and their allies, especially if they don’t get their way. Pressure on you to make the narcissistic family look good to outsiders. Rejection or abandonment if you do not. Outsiders are treated as more important than family. Meanwhile, your accomplishments are ignored, minimized or even criticized, unless your talents make the narcissist look good. In other words, in a complete reversal of reality, you are accused of and punished for other people’s narcissistic expectations, demands and behavior. Projection is the name for this kind of behavior, which in itself is a classic narcissistic defense. Doubting your self worth. Believing you are ‘bad’ or defective. Buying into negative feedback from family. Having an overwhelming need for external validation. Feeling anxious, overwhelmed or confused not knowing what your family wants from you, or how to please them. Believing you have to make the narcissist happy to prove you are lovable and not ‘bad’ or the problem. Difficulty making and keeping relationships. Choosing narcissistic partners or friends. Fear of abandonment, once someone finds out how flawed you really are. Why Do Family Members Align With the Narcissist? The narcissist appears to have power. They call the shots, command attention, control decision making and extract compliance from others. They are defective ‘alpha dogs’. Those who go along with this power grab hope to share in the power – or at least not be targeted for abuse. Fear of facing ‘the awful truth’ about family or oneself, and having to do something about it, leads to minimizing or denying the existence of the problem. Faced with the potential of being attacked and rejected, and the general upheaval that can stem from taking responsibility for admitting the truth, many narcissist supporters will choose to ‘look the other way’, at tremendous cost to themselves and the family. In short, your psychological well being depends on it! Family relations are at best strained and, at worst, broken down in narcissistic family systems. There is a pattern of negativity that has been going on for a while, and never seems to improve, wearing you down emotionally. The truth is that things likely will not get better, as narcissistic people lack the empathy and insight that would motivate them to change their attitude and behavior for the sake of their relationships. Their supporters lack the will or courage to think for themselves, or they believe they benefit from this arrangement. This extracts a heavy psychological toll on healthier family member(s) like you who attempt to function within and possibly ‘improve’ toxic family dynamics. In spite of good intentions, this is usually a set up for failure! The most likely outcome is that you will continue to be caught up in a vicious cycle trying to appease the narcissist and walking on eggshells or confronting their self centered behavior, leading to repeated angry outbursts, hostility, shunning, blaming and shaming reactions from the narcissist and his/ her supporters. You may be subject to scapegoating – family bullying – from narcissistic family members and their allies. What’s worse is you may have learned to blame yourself for the problem too. Understand that someone who has a history of entrenched narcissistic behavior is not going to change, and you can’t help him/her to heal or become a better person. You simply don’t have that kind of power! There are long term therapies that can help narcissistic people, but few attempt this as they are unable to acknowledge that they have a problem, never mind do something about it, unless something huge is at stake. For example, their spouse threatens to leave them or they are disciplined at work. Even under those terms, it is difficult for narcissistic people to accept that they have caused or contributed to problems with others, as they see themselves as victims. The narcissistic family member won’t let you have a meaningful, love based relationship as they simply don’t know how, and can’t see the value of it to themselves. It’s all about maintaining power, and love has no role to play in that equation. They don’t care about you, not because you aren’t valuable, but because they don’t know how. In that way, narcissistic behavior is not personal, but a reflection of something missing in the narcissist. If feels very bad however, to be on the receiving end of this abuse or neglect, especially for children of narcissistic parents who never received the love and nurturance required for healthy human development. Stop expecting the narcissist to become reasonable or caring – if only you can get through to him/her. It’s not your job to ‘fix’ them, and it’s futile as well. Realize you are not responsible for the narcissistic person’s abusive or negligent actions, no matter how much they try to blame you or claim victimhood. Choosing to exercise self control and not act abusively is a fundamental adult responsibility. Stop disclosing any personal information that the narcissist can use against you. This includes how you feel, what’s going on in your relationships or your job, or anything you are struggling with that makes you feel vulnerable and in need of support. Do not ask for help or offer to be a rescuer. Keep the conversation superficial. Avoid power based emotional subjects, such as naming the problem or discussing appropriate family behavior. Distance from negative family interactions by deciding to go to minimal or no contact. Set ground rules with your self about what you are willing – and not willing – to tolerate regarding behavior from other family members. Set limits on how much time you are willing to invest with family. Connect with allies in you extended family, if any. Test the waters by taking low risk steps to establish trustworthiness. For example, inviting them for coffee, keeping the conversation light, and seeing if they appear to be caring and interested in you. Consider getting counselling from a therapist who specializes in family abuse and scapegoating. If you are the adult child of a narcissistic parent(s) you have been deprived of essential parental support and appropriate guidance. If you are questioning your self worth, have a hard time bonding with others, are vulnerable to falling into negative relationships (repeating the original trauma), or prone to self destructive behavior, seek counselling to help you build up you sense of self worth, overcome the hurt and become the person you are meant to be – a person of worth who deserves peace of mind and fulfillment. Glynis Sherwood – MEd, Canadian Certified Counsellor, Registered Clinical Counsellor, specializes in recovery from Scapegoating, Low Self Esteem, Anxiety, Depression, Grief and Addictive Behaviors.